The Prince George’s County Fire/Emergency Medical Services (EMS) Department offers the following safety tips, to help ensure all citizens, residents and visitors will enjoy a safe and festive Thanksgiving holiday. Unfortunately, fire safety and injury prevention guidelines are often overlooked during the holidays. Prince George's County Fire Chief Benjamin M. Barksdale stated, "Everyone needs to keep Safety First and by doing so our citizens, visitors and businesses can avoid tragedy and disruption of their holiday festivities." The Federal Emergency Management Agency's (FEMA) United States Fire Administration (USFA) issued a special report examining the characteristics of Thanksgiving Day fires in residential buildings. 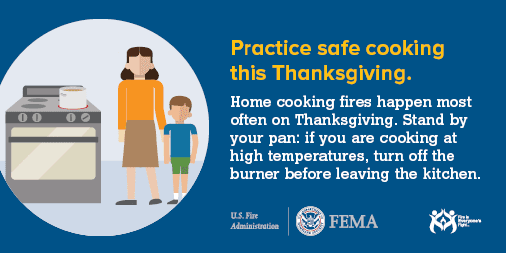 The report, Thanksgiving Day Fires in Residential Buildings, was developed by USFA's National Fire Data Center. 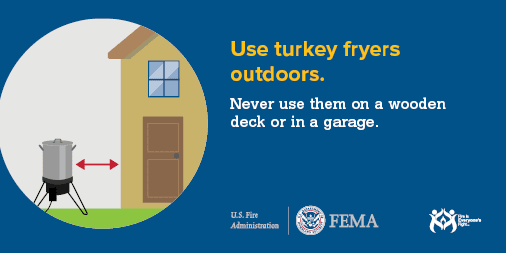 If your Thanksgiving plans include a Turkey Fryer, this is another whole story by itself, click here for Turkey Fryer Safety Tips from 2015. • Overnight guests should be instructed on your exit drill from the home and designated meeting place for your family. Sleep with bedroom doors closed (see video below). • 10-year smoke alarms are now required on every level of your home, in hallways just outside of sleeping areas. The Prince George's County Fire/EMS Department strongly encourages a 10-year smoke alarm be installed in every bedroom and to sleep with your bedroom door closed. Watch Fire Chief Barksdale provide this important explanation. Test smoke alarms on the Safety First Day of every month. Working 10-year smoke alarms are required in all residences in Prince George's County. Working carbon monoxide detectors are also required on every level of your home if you use a fuel for cooking and/or heat, have a fireplace and/or an attached garage. If you can not afford to purchase a 10-year smoke alarm you should call 311. A firefighter will install a working smoke alarm in your home; free of charge.